For much of my life I believed what well-meaning people taught me. They said I could talk to God through prayer, and he would talk to me through the Bible, but that I couldn’t directly hear from God. Though both methods provided one-way communication, when paired they effected dialogue—sort of. They were right but they didn’t mention actual supernatural communication, the kind that happens in the Bible. While I believed this degree of interaction with the Almighty is possible and still happens today, I assumed it only materialized with select people and occurred in limited instances. A friend who talks with God daily asked if I, too, wanted to hear directly from God on a regular basis. Block out an hour of time with no interruptions. Ask God to speak to you and be ready to listen. Jot a question on a piece a paper, and then verbally ask God that question. Write down everything that comes to mind. After thirty minutes I had three pages of notes and clear direction to deal with my question, but I wasn’t sure if those were God’s words or my thoughts. I tried again a week later. This time I suspected some of what I wrote came directly from God. After more practice I was able to distinguish my thoughts from God’s words, which he places in my mind. Though I occasionally hear a few words aloud, mostly God plants his words in my mind. Over time we began having conversations. We’ve been doing this for the past ten years. When I ask a question or share a thought, I generally hear from him right away – assuming I’m really ready to listen. This is my experience, while others who talk to God have other experiences, but the point is having regular, genuine communication with God. It is possible to hear from God, and it does happen today—even with ordinary followers of Jesus, like me. Paul wrote to the Ephesian church that “the sword of the Spirit is the word of God,” Ephesians 6:17. Christians who have a limited view of Holy Spirit power in our world today think Paul means the written Word of God (even though the New Testament didn’t exist when Paul wrote those words). I think a better understanding is that the sword of the Spirit is the spoken word of God, courtesy of his Holy Spirit. 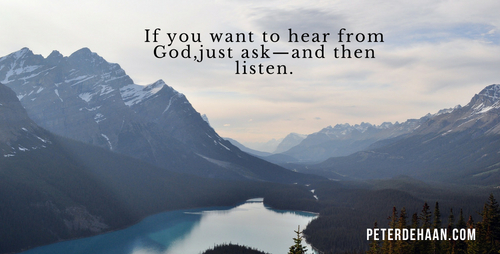 If you want to hear from God, just ask—and then listen, really listen.